The building of the abbey began around 1369. The abbey is also called Blakyrkan (the Bluechurch). It is built of blue-grey limestone from Omberg , from this the name Blakyrkan. It was consecrated in 1430 in the presence of king Erik of Pommern and noblemen from the whole of Sweden. Also the bishop of Linkoping was present. The abbey is built after Birgitta´s very careful instructions. She didn´t think that the abbey should be decorated. Exceptions were made anyway. One example is the decorative paintings of the arches which were found during the restoration 1978-1983. The walls had been plastered and whitewashed too, if they had been decorated nobody knows. The church doesn´t look the same as in the Middle Ages. Then there was a gallery for the nuns, a Mariaaltar in the east, a procession gallery and a barrier that separated the abbey people from ordinary people. In the abbey there were also about sixty altars. In the church there are lots of nice sculptures and art treasures, for example the Saint Birgitta altarlocker and one of Sweden´s most beautiful triumphal crucifixes. One of the articles of most value is Saint Birgitta´s shrine. It´s a velvetdressed wooden shrine with gilded fittings. The shrine is made in the monastery and contains 23 skeletonparts and two craniums. They are from Birgitta and her daughter Katarina. The big organ is made by EA Setterquist and son. The small organ was built 1950 by Nils Hammarberg. 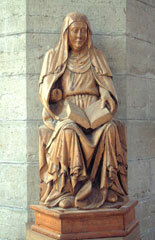 The abbey has reviewed three restorations,1650, 1895-1898 and 1979-1983. In 1650 there was a lot of changes. The decorations from the Middle Ages were torn out. 60 altars,galleries altars, galleries, stairs and stairledges disappeared. Almost every pillar was torn at 1895, then new pillars were built up again. Even the decorations were changed, with the benches turned to the left. They are still planted like that. The paintings in the ceiling were also whitewashed. In the church many are buried but that was only rich people who had money to buy themselves a tomb inside the church. 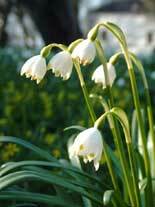 Most of them were noblemen, craftsmen or priest. The coffin of Gustav Wasa´s son duke Magnus hangs inside his monument. He wanted it that way because he was afraid of spiders. When the church was restored the tombs were rearranged so the finest tombs were moved forward. 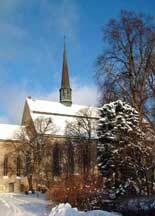 In 1829 the abbey became a congregation church for the Swedish church. Earlier it wasn't open to the public. Sometimes it was used for weddings and big celebrations, often with royal persons as the arrangers. Every year the abbey is visited by thousands of tourists. The tourist department in Vadstena also arranges guided tours. 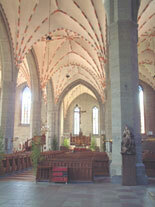 The abbey is not only used by Vadstena congregation but it is also let to among others the catholic church.